Thanks so much for all your well-wishes over the last few days. I can’t speak for all of Atlanta, but my immediate area seems to have fared quite well. Hurricane Irma was mostly a tropical storm when she arrived here, so though we got plenty of wind and rain and the lights flickered a few times, we never lost power. My biggest concern was that a tree would come down, but thankfully that did not happen. Also, thanks again for all your amazing suggestions for preparing for a hurricane or bad weather in the comments of THIS post. Those were so helpful! 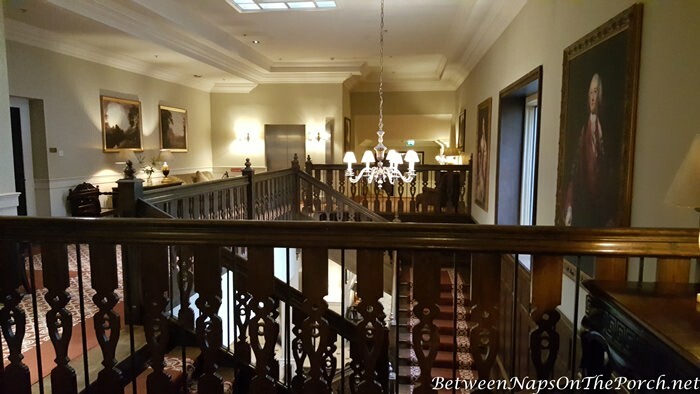 During my recent “Deluxe Irish Castle Tour,” we stayed in some of the most enchanting places. 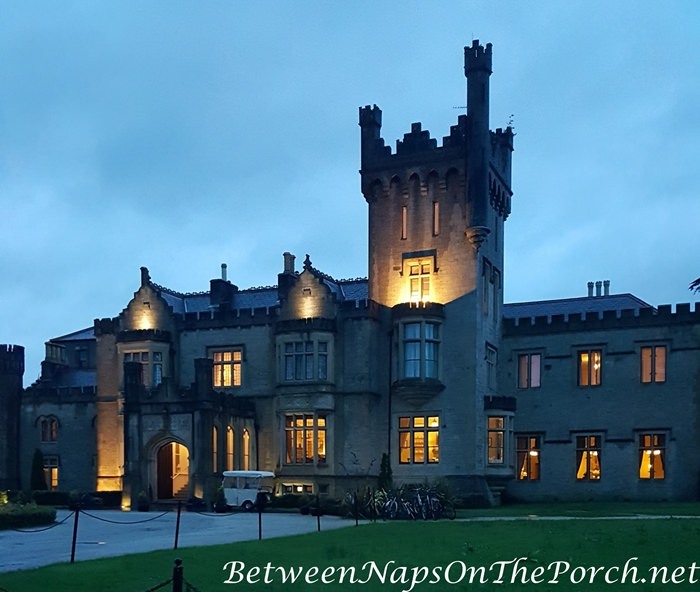 The two that truly made my heart sing were Lough Eske Castle and Ballynahinch Castle. They were magical and if you ever take a trip to Ireland, I heartily recommend both. You know I love to take you through home tours here at BNOTP, but it’s not often I get to take you on a castle tour! I think this may be the first one of those I’ve ever posted. 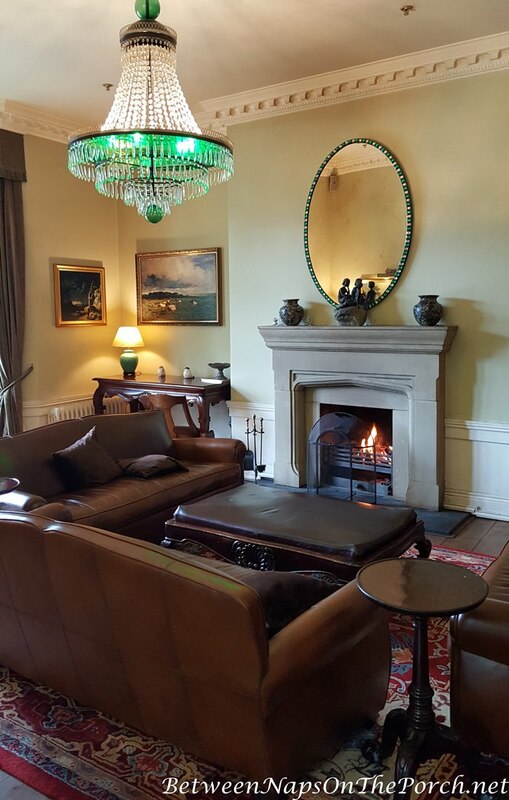 It won’t be the last, though; I’m looking forward to sharing Ballynahinch Castle with you very soon. I took a lot of of pictures while in Ireland, and it’s agonizing trying to choose the ones to share in a post. I want to share them all, but obviously that’s not practical. 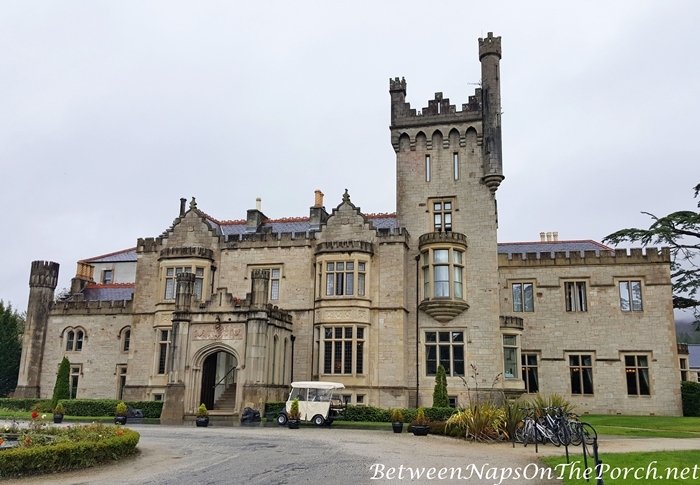 In today’s post I’m taking you inside beautiful Lough Eske Castle. As mentioned in a previous post, the first few days in Ireland were misty/rainy ones, but then it wouldn’t be Ireland without a bit of rain, would it? 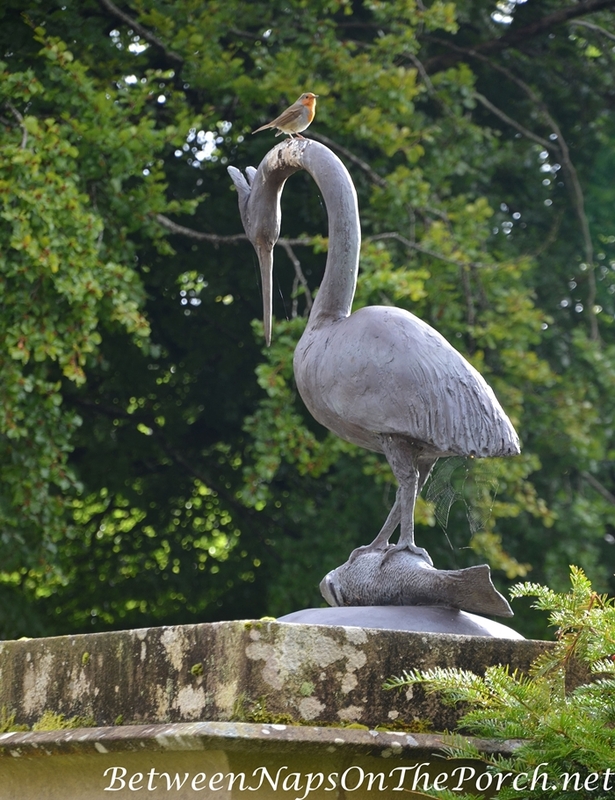 Lough Eske had a wonderful fountain just outside its front entrance. To see this lovely fountain in action, check out the short video I shared at the BNOTP Instagram here: Between Naps On The Porch. 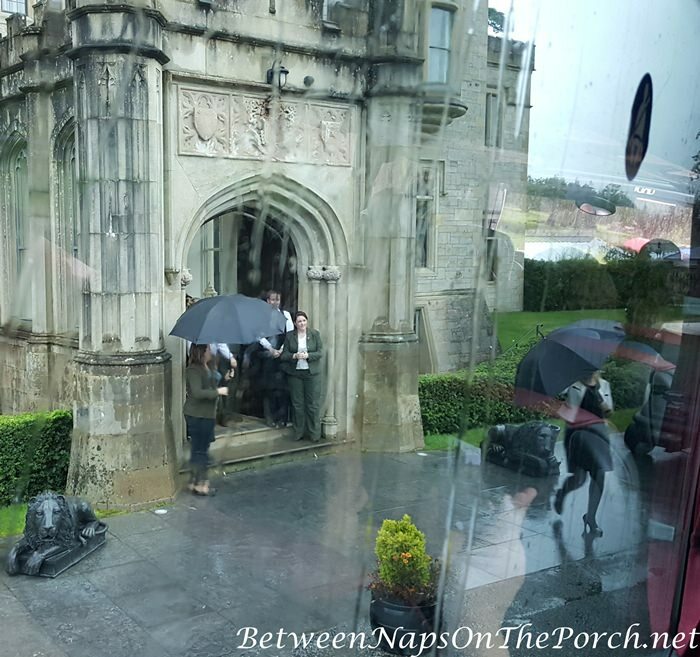 Despite the rain, the staff at Lough Eske castle came out to greet us in person, making us feel very welcome. They truly gave us a “Lord and Lady of the Castle” moment, adding to this already enchanting, fairy tale experience. 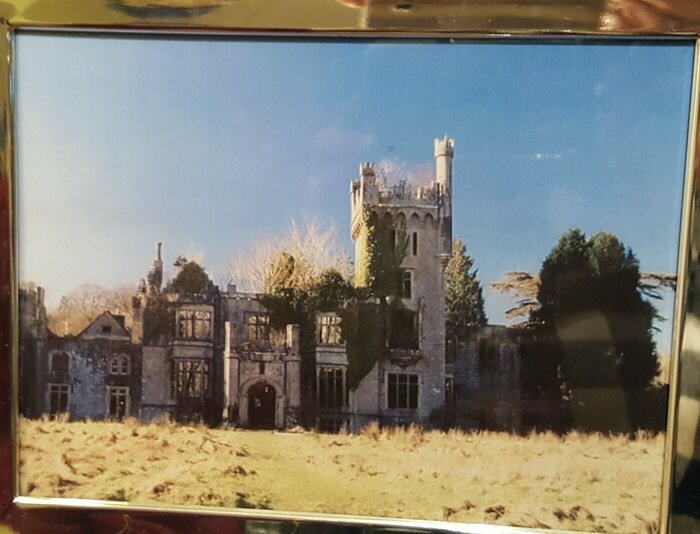 Just inside the entrance is a framed photo showing the condition of the castle before the castle was restored. 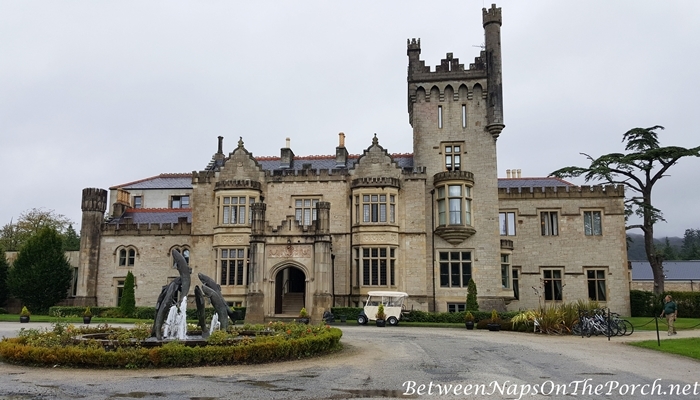 Lough Eske has an amazing history with lots of twists and turns. In 1939 a billowing curtain in a window in the ballroom caught fire from a candle. Unfortunately, that wing of the castle, which included the ballroom and billiards room, was destroyed in the fire. 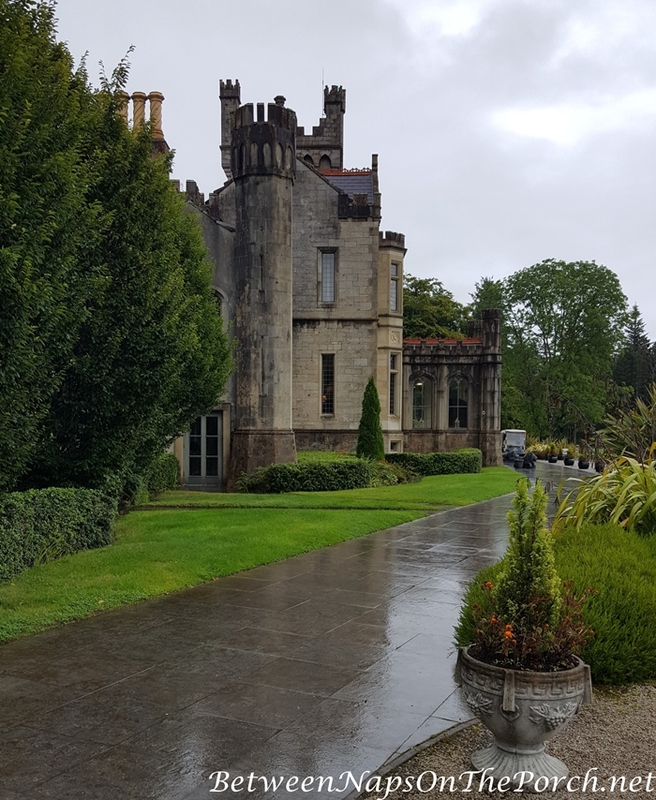 The Knee family, owners of the castle at the time of the fire, decided to leave Lough Eske castle and sold the home. Over the years the home fell into terrible disrepair and was pretty much abandoned. In this article, History of the Castle, it states, “trees had sprung up through the inside of the castle and their strengthening roots threatened to knock the castle down altogether. 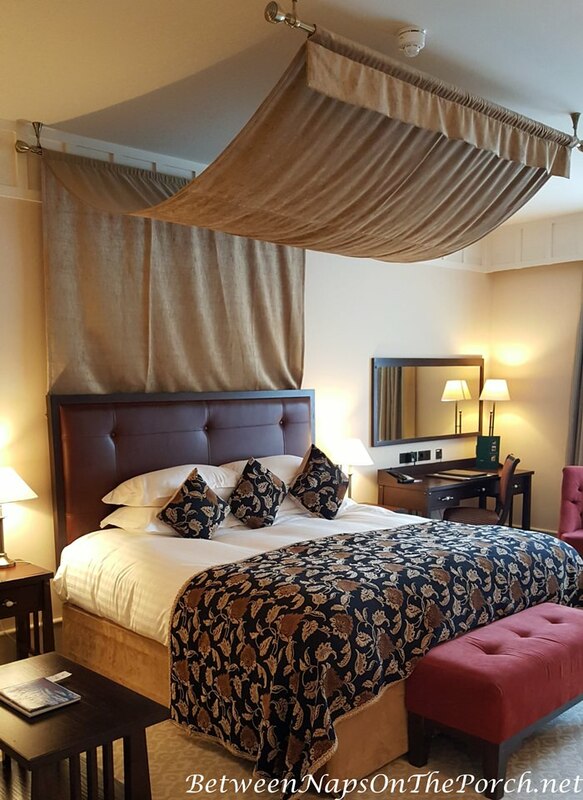 Fortunately, the current owners saw the value in restoring Lough Eske Castle and though it took 18 months and a tremendous expenditure, the Solis Lough Eske Castle is a beautiful place once again. 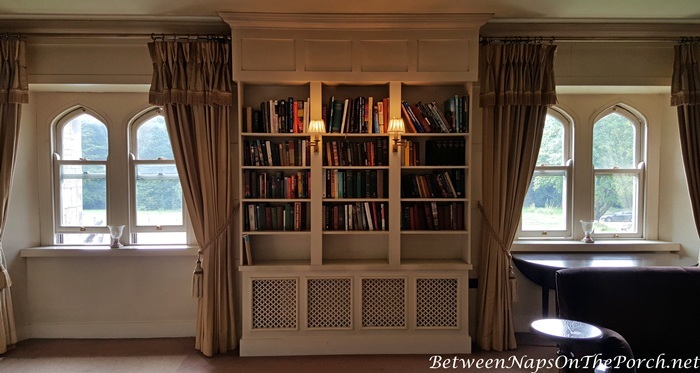 In the restoration, the owners recreated the interiors of the public rooms in the style of an elegant early 20th century Edwardian country mansion. 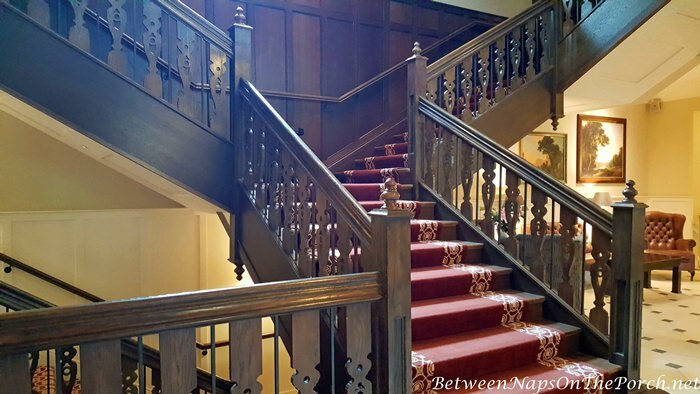 The grand front staircase is really beautiful! Love the gallery at the top of the staircase! Notice all the beautiful paintings! I wonder if that’s how the “gallery” area at the top of a staircase got its name? There were two sitting/living room areas on the main level of the castle. 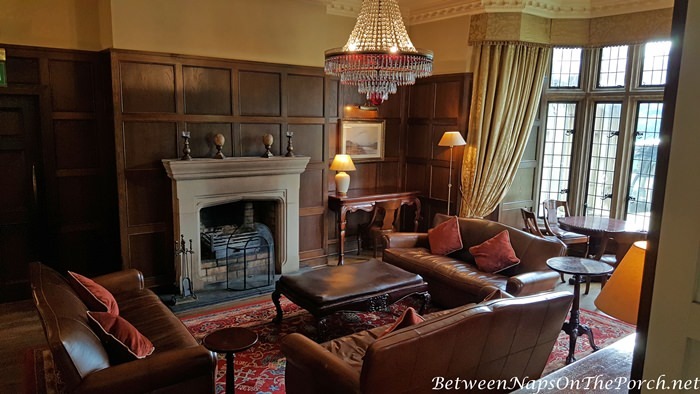 I wondered if they were designed to be “his and her’s” sitting rooms or drawing rooms, very much like you see in large homes here in the south. Back in the day, after dinner men would usually withdraw to one room, (thus, “drawing room”) while the women retired to another. 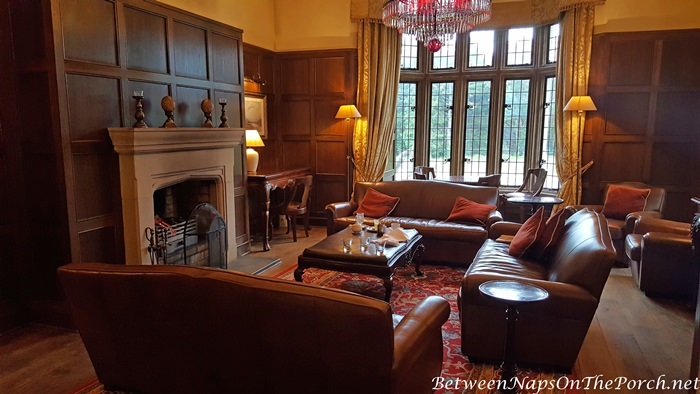 In the evening a fire was always lit in one or both rooms, making these rooms super cozy. The other living room on the main level was just as beautiful. 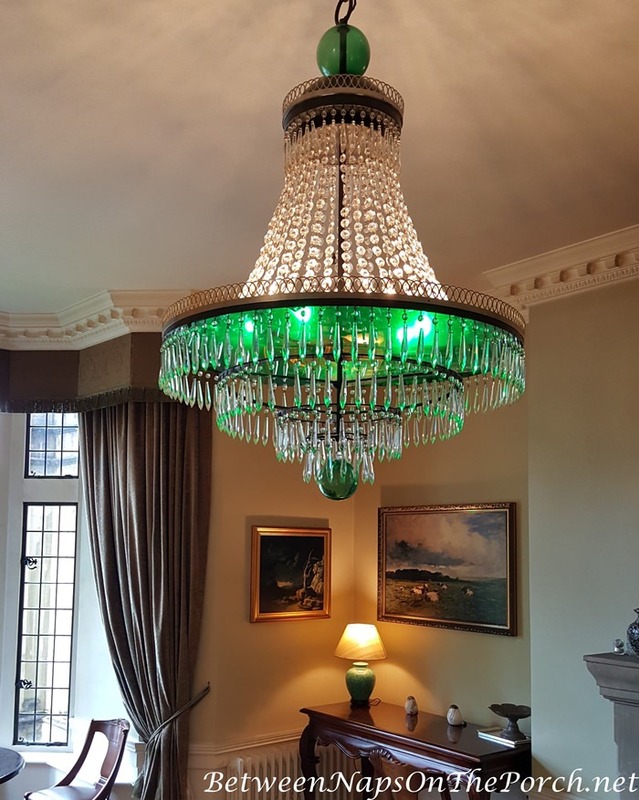 It had a similar chandelier, only in green. I would love to know more about these chandeliers…wonder if they are Venetian. 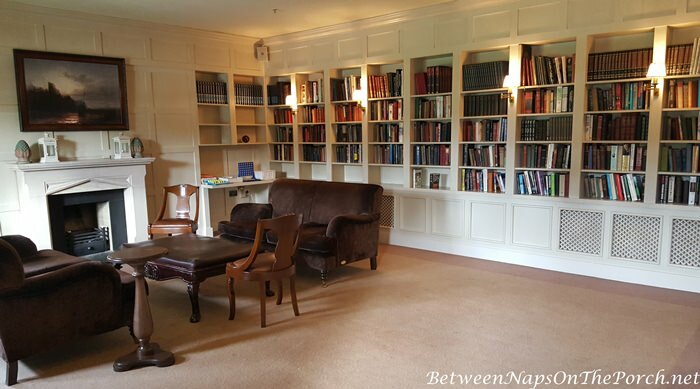 The first time I visited the library in Lough Eske, there were too many people enjoying the room to take photos. I lucked out and caught it empty one day and snapped a few pics. This is the room we saw from outside with the beautiful, arched windows. The view overlooks the fountain. 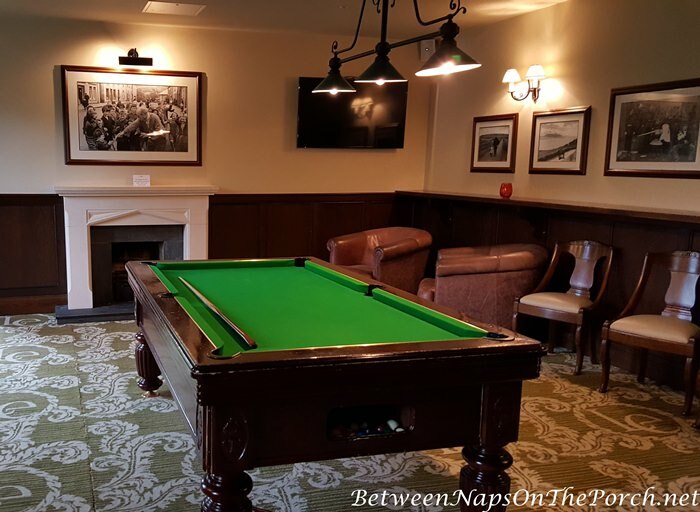 A little more exploring took us to the Billiards Room. 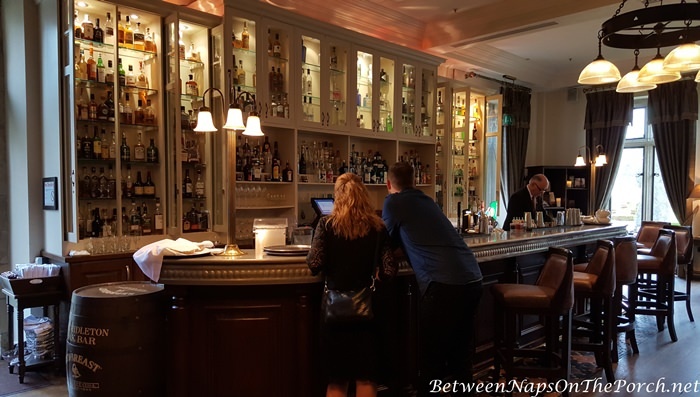 There was a large bar area for guests. This was my room and I slept very well here. Back outside, I took a stroll around the gardens. This cheeky little guy stayed close by, keeping an eye on me. I felt like Mary in The Secret Garden. 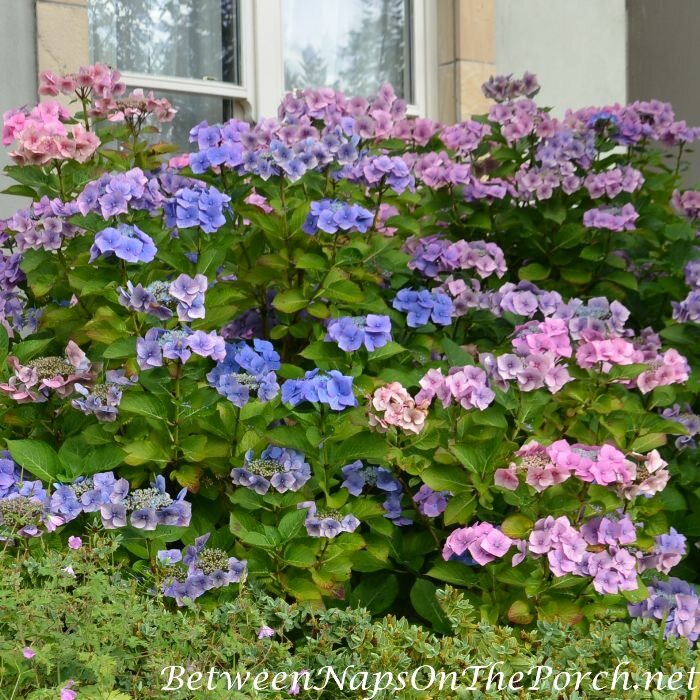 Though the garden was on the wane this time of year, there were still a few things in bloom. There’s a lot of beautiful statuary all throughout the garden, so even when there isn’t as much blooming, there’s still so much to enjoy. I’ll leave you with this lovely view of Lough Eske Castle at the end of the day. It was just the start of the “Blue Hour.” Lough Eske is truly a fairy tale castle! 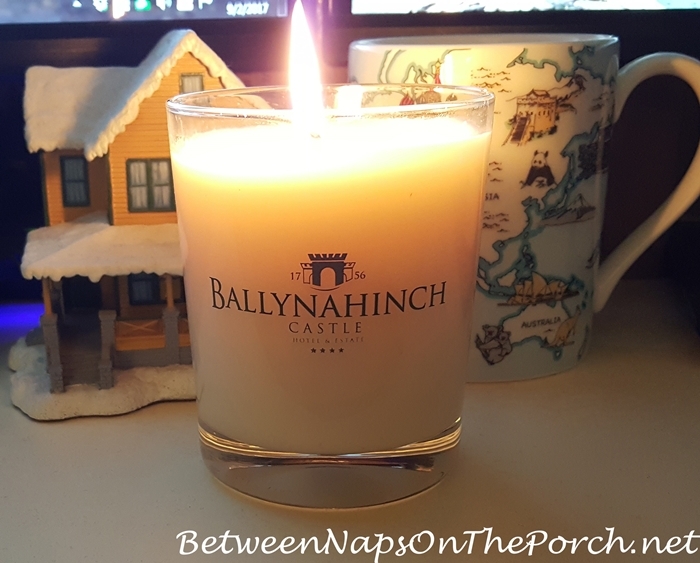 Looking forward to sharing Ballynahinch Castle with you very soon! 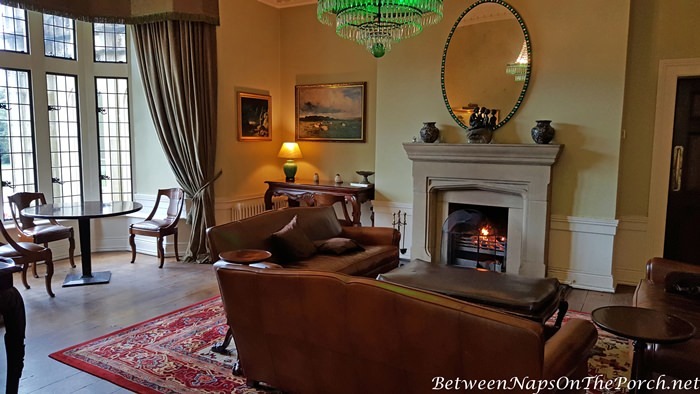 You’ll find photos of the room I stayed in while visiting Ballynahinch here: Beautiful Bedroom and View in Ballynahinch. SO GLAD!! to hear that you made it through the storm with no damage. Taking this tour with you through an Irish castle on a rainy day was a lovely interlude to my day. Thank you! 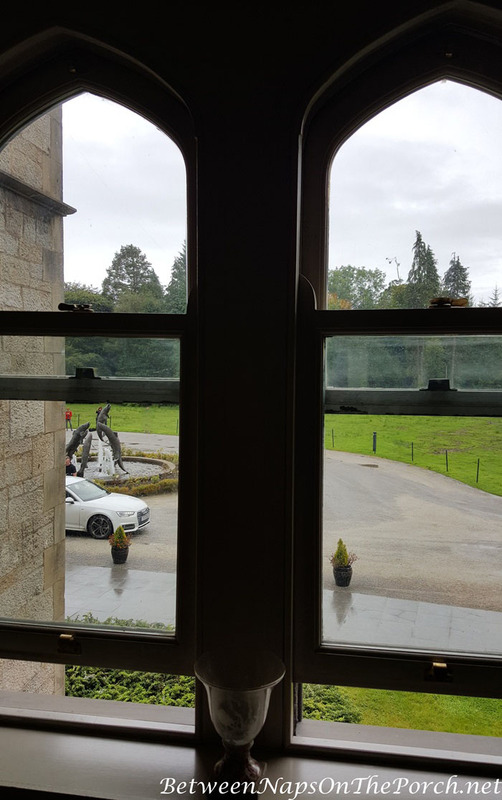 Hi Susan – What a lovely tour of Lough Eske. Remember how those two local guides in town kept trying to get us Southerners to pronounce it correctly? I think it was “Laaaa S..Ka” Something like that. Loved your photos. The Castle is as luxurious as it looks in the photos. I agree, the VIP welcome by staff with warm hand towel and fruity drink was delightful. 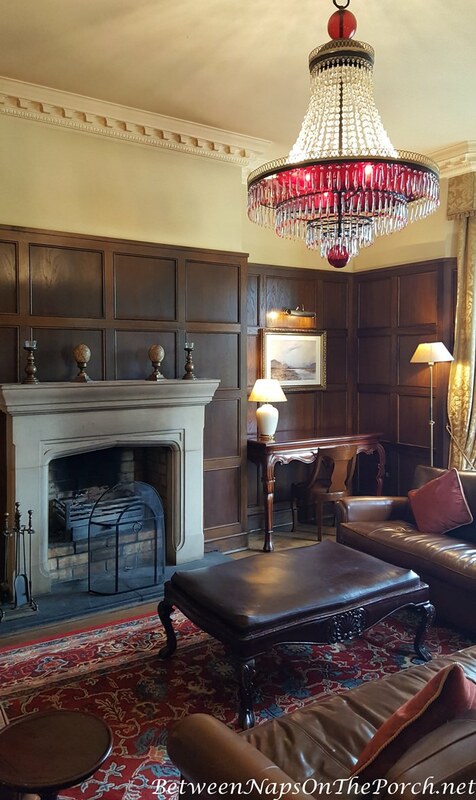 The billiards room is where I viewed “Game of Thrones”. The Castle Engineering Tech and Hotel Mgr were happy to accommodate my obsession because guests don’t receive that cable TV channel in the rooms. I still have to upload my photos to the computer. You are so efficient, inspiring and motivating! Thanks again for the walk down memory lane. Oh, so that’s where you were watching, I’m so glad you got to see it! That was so nice, they really know how to make their guests feel welcome and appreciated. Susan, Have had you on my mind while watching as hurricane Irma slammed in and wondered how you were doing. So glad to see you made it through unscathed, although I will say, if anybody was prepared it was you! I loved the post about what you did to get ready and the item links you shared for your emergency preparedness. I have taken heed in all your excellent information to get our house in order for emergencies and I can’t thank you enough for the helpful advice. Now as for this post…oh be still my beating heart…this Ireland excursion is a must do trip I can see! After our trip this next year to Alaska, we’re Ireland bound for the castle tours! I’ve absolutely LOVED all the posts’ about this land of enchantment! Oh and just for the record, I did order the Nicole Lee rolling tote and just adore it…what a fun and practical way to navigate the world! Thank you again for all you do my friend, you’re amazing! Thanks so much, Terry! I feel so much more prepared now. I know I’m going to refer back to the comments on that post I linked to anytime we have a big storm event coming. There were so many ideas in there I would never have thought about. One thing I did that I never got around to mentioning is I took all the pictures albums from the top shelf of my master closet and placed those in plastic bags and brought them down to the dining room. If a tree had fallen on the roof, I would have been so upset if I had lost all those albums to rain/water. So I felt better knowing they were down a level and inside plastic bags. I would LOVE to see Alaska! Can’t wait to hear about it when you return. You will love Ireland and the people there are just so nice! So glad you like that tote…I love mine! It still looks brand new after all the trips I’ve taken it on, so it has held up great! Glad all is well at your house! 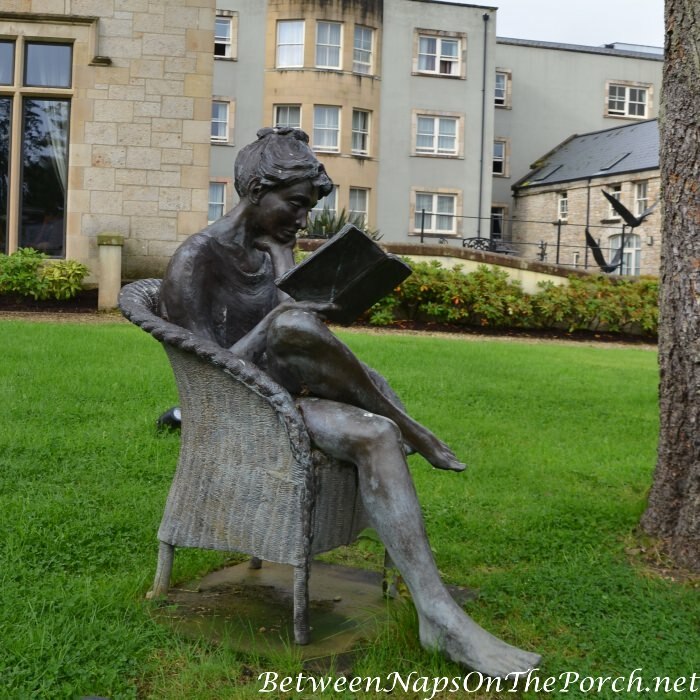 I ADORE that statue of the girl reading in a wicker chair. I’ve never seen anything like it. What a wonderful trip and thanks for sharing it. Oh wow, I finished the post, wanting more! This just looked fabulous, and your accommodations fantastic. I keep telling my husband about these trips of yours. This is one I’d love to take. My dad’s people were from Ireland. Thank you for sharing. Thanks, Rita! You would love it, Rita! Definitely one of my favorite trips! My wife Kristin and I have this trip planned for next July. We’ve been to the U.K. four times, but only enjoyed a 2 1/2 day scurry up the east side of Ireland. We’re looking forward to a more in depth look at the Emerald Isle. July sounds like the perfect time to go, David. I definitely want to go back again some day. You’ll love it, even when it’s raining, it is still a beautiful country. Must put this on my list to visit. Thank you so much for sharing your adventures with us. So glad you came out unscathed. My friend’s homes in Houston were okay as well. One of my friends did roll up her rugs and put them on her bed. She, too, was prepared. I am hoping this is the end of our hurricane season down here in the south/southwest. Can’t wait for your next post! Thanks, Paula. I hope so, too. I’ve lived in Georgia my whole life except for a period of 4 years when we were stationed in AL, and this is only the second hurricane I’ve ever heard of possibly effecting us in the Atlanta area. I don’t have to worry about flooding, but it’s the trees that scare me. We have a lot of trees here in GA. Glad you friend and her home was safe! I am so glad you didn’t have any storm damage. Irma was a huge storm, I feel so bad for Florida. What a beautiful Castle! I love that they had the fireplaces going, so cozy. Those chandeliers and mirror are beautiful too. I can’t wait to see more of your trip. It was…we were very lucky that it mostly ran out of steam before it got to the Atlanta area. Thanks, Charlotte! This had to be such an amazing trip, getting to stay in a castle! 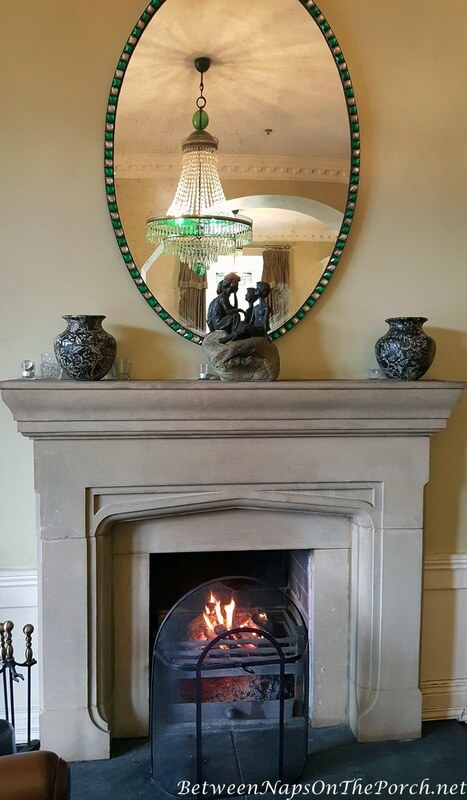 Noticing the green on the chandy and mirror made me wonder if that was for Ireland. Thank you for this tour, and very glad you didn’t suffer any Irma damages. We’re in for some rainy days until Saturday, but who can complain after the devastation so many have just experienced…just heartbreaking. Hugs! Our rain just finally left last night. I know, it’s heartbreaking to watch the news. Mother Nature can really wreak havoc. Scary! Susan, I really enjoyed touring this castle with you. It is truly beautiful and your room was exquisite! We really loved Ireland when we visited two years ago! I am glad you didn’t have damage from Irma, we have a lot of tree limbs and debris to clean up when it stops raining! Janet, you can email me at [email protected]. Wine, beer were not included. I would definitely recommend this tour to anyone wanting to see Ireland. I felt it was very reasonably priced, as well. I am glad to hear your precautions were only precautions. You were definitely prepared. The castle looks so appealing. I think I spied a candle that came home with you sitting next to Ralphie’s house. Thanks, Iris! Yes, we lucked out! lol Yes…had to bring one of those home with me. It smells sooo good…very smokey, woodsy, which is my favorite type scent. I brought two home and when these are gone, I am definitely going to order more. This could be an expensive habit! One good thing, it burns very slowly. I’ve been burning this one a lot and it’s hardly gone down. I loved the castle tour; you summed it up really well with interior and exterior shots and descriptions. It was beautiful even on a rainy day. Theresa, will you be sharing any of your photos and thoughts? Happy to hear those huge trees in your backyard stayed put! Mine too, but our neighbors had some towering trees snap. On these chilly days I would love to pull up a chair and watch a slide show (yeesh how old am I?) of your beautiful trip. Each photo seems to tell a larger story and it’s obvious how much you enjoyed every minute. Do you jot notes as you go? How do you remember all of the details? Love seeing all of your photos and captions, and can’t wait to see the next castle! Glad to know that the affects of Hurricane Irma weren’t too bad for your area. What a fantastic castle you stayed at- and I’m so glad they restored it. The thought of trees growing inside of it is hard to imagine. That candle sounds just like the kind of smell I enjoy too! What a trip! It really is over-the-top beautiful. Thanks for sharing. So glad you are safe and no damage. Eager to see more wanderlust pictures! Love it! Those colorful chandeliers are so lovely! Such a nice place. We have Knee family in our family tree.